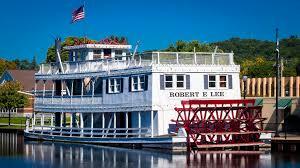 But the town’s most famous claim to fame is a riverboat named The Robert E. Lee that they use as a showboat. When the White Supremacists had their rally in Charlottesville, VA, last summer it set off shockwaves that were felt all the way up here in Michigan. A hot debate and a petition drive to change the name of that showboat became the area’s obsession and it ended with one of the city’s leaders resigning and the others making plans to change the showboat’s name. "A few coats of paint and a steady hand is all we need to take the right symbolic steps to denounce racism." Back on topic: The outside of the buildings on Main Street might be turn-of-century quaint but the two art places we explored first were anything but quaint inside. Except for the original hardwood floors, they’d been gutted and were sleek and modern---high black ceilings, white walls, with great lighting that showcased a large assortment of work by artists working in various medium. The one place was an artists’ co-op, the other was an impressive art gallery and the theme of the show we saw was places in Michigan. My God, I could not believe the prices on the paintings---mid hundreds to low thousands! Made me wish I was still an obsessed wanna-be artist. Also makes me glad I still have all my framing and mat cutting tools, should I ever decide to become the next Grandma Moses. We also found some nice antique shops after lunch. The place where we ate, though, had great food but it was tacky with a capital T. It’s been a long time since I’ve eaten in a place so in need of a good purging and a makeover. But it’s good to be reminded from time to time that while I might come home to messy house once in a while it’s never truly dirty or neglected for lack of money to keep it up. That sad little place with its friendly waitress and cook sporting prison tattoos was well pass its heydays. A set of sliders at the back hinted at its former glory. They once opened to a long-gone deck that would have given outdoor diners a good view of the showboat parked across the river. But one thing struck my funny bone---a sign on the front door about wiping your feet before coming inside. The inside was so at odds with what that sign suggested we’d find---I expected prissy pristine---and that still cracks me up. Speaking of bones, I saw my orthopedic doctor the next day to get the results of my yearly bone density test. Great news! There was so much improvement from the Reclast infusions that my risk factor for a major osteoporotic fracture (hips and back) had gone significantly down. Now for the bad news. I had surgery at my elbow back in 1999---broken bones in three places---and it’s been hurting again, so I asked the doctor to x-ray it. When he looked at my images he said, “Wow! What we’re looking at here is a massive surgical failure.” One of the screws that once held the top of the ulna bone to the bottom was floating around free-willy in my flesh. 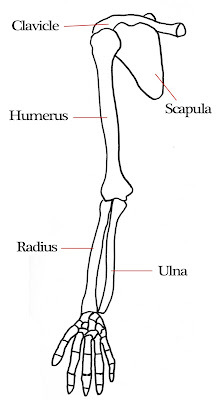 Another screw that looked to be around 1 ½ or 2 inches long had backed half way out and was no longer anchoring the ulna bone to the radius bone like it was supposed to do, and a stress fracture was showing a few inches below the screw. The bottom line: Every time I lean on a table, for example, or put any kind of pressure on the back of my lower arm---I get a sharp pain. And I get a duller pain in my forearm every time I rotate my wrist. He said to fix the mess would be “a major ordeal involving a very long surgery, weeks in a cast and months of physical therapy” then he added a few more 'wows' like he couldn't believe what he was seeing. 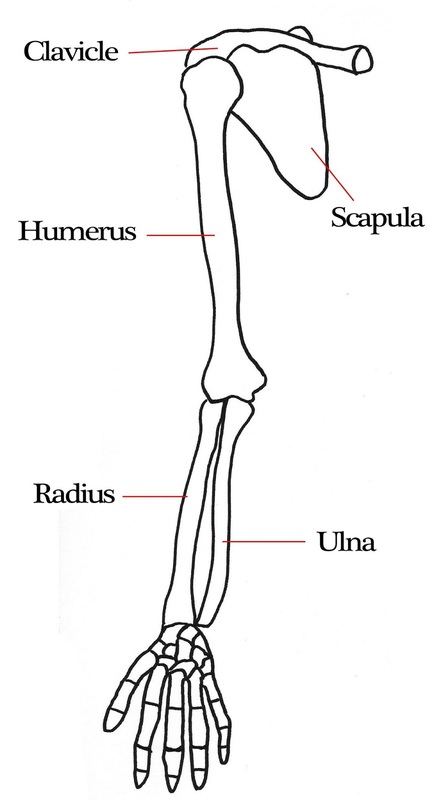 The good news is I’m not getting a pinched nerve---yet---but that may happen down the road, he said, as the ulna bone floats around unconnected at the top and with the screw migrating around. I can never again lift anything above my waist. Bench pressing is out, too, which I was actually doing last year at the YMCA. P.S. In case anyone is wondering, this elbow is not the same one that I had the Popeye’s Elbow in earlier this year. Good Grief. I suppose the old saying, "you have a screw loose", has a new meaning for you? The place you mentioned sounded a lot like Chesaning. We used to go to the Show Boat shows there. They used to have a wonderful restaurant, but all that has changed now. Sad. Oh, I wish I can change the name of this post to "I've got a screw loose" without it getting lost in cyberspace. That really gave me a good laugh this morning. It always fascinates me how so many little towns that started out as trading posts but some grew huge (like where I like) and some stay so tiny. The woman I went with to this town says they have a couple of great restaurants but we picked this one because we could walk there. How could you go wrong with a place that wants you to wipe your feet before coming in. LOL I had that best sweet potato fries I've ever had in my life, there! eek! This is awful! I'm so sorry! (though great news on the bone density front. I'm due for another bone density test. First one was great though.) Again, so sorry about this turn of events. I hope he can provide enough relief that surgery isn't worth the effort. I'm hoping to avoid surgery or at least for as long as possible because having gone through the first one I know how hard life was to spend 12 weeks in a turn buckle cast and I was younger then and had Don to help. But knowledge is power and I'm really glad to know what is going on because I have issues in my hand that all make sense now. My primary was ready to send me to a hand specialist whenever I was ready but I would have probably would have gotten treated for something that starts up much higher than my fingers. Below the next comment the writer left a LOT of blank space so please scroll down to see the other comments left below the blank area. I wrote a comment which, I think, disappeared into the ether! If it didn't and I've said the same thing twice, apologies. I mentioned that the name Robert E Lee doesn't resonate with me, as a Brit, as it probably does in the USA, but then thought if a boat here was called The Adolf Hitler I would definitely be petitioning to have it changed! I hope all goes well with any operations you have in the future. Best wishes. Thank you "around-the-table." Robert E. Lee was a confederate general during the Civil War and the White Supremacist rally caused a lot of communities to fight about name changes of places named after southern generals. You Hilter comparison is a good one to help understand what so many believed the time was right. Thanks for stopping by! Oh my! The elbow situation sounds awful. Now you will be worried about where that loose screw will travel!!! Any recourse for this mess? Maybe as part of recovery you could get a FREE hot young strong man 24/7 to help you. Good for you for planning an outing for just two! FUN!!!! The doctor will talk about options on the next appointment and I think one of them was to just go in and get the traveling screw before it hits a nerve. I have a list of a dozen questions already to ask him but knowing him, his little talk ahead of time will give me the answers before I get a chance to ask. I really trust this guy. He's done 17 bone surgeries on various family members. Oh my, that is a challenging situation to say the least. My inclination would be to say do surgery now while you are younger, not older. That's definitely one way to look at but I've got to know, first, what the odds are for making the situation worse with the full surgery and cadaver bones as opposed to just going in and removing the screws and wearing an elbow brace forever. There is already nerve damage going to my fingers and surgery isn't likely to help that. You said it, it's a challenging situation to think about the pros and cons and options. If I was older, the dog would be gone and I might be living in a place with more people around to help. Bob’s step-mother had no bone in one arm from shoulder to elbow. She was in bad car wreck. Seems like an infection caused them to remove the bone. Both arms were broken and I remember making her a dress length cape to wear as a robe during that time. You’ve got some very serious things to consider regarding this situation. Funny you should mention that, I actually was going to ask the doctor if that messed up bone was really necessary. That cape was a great idea! I hope you get this resolved, and that it doesn't cost you an arm (or a leg)! On the good side, I'll probably meet all my insurance deductibles this year. That usually doesn't happen until December and they start all over again the next month. I have a very high tolerance for pain. I'm just glad I asked him to x-ray the arm. I wasn't going to but now I'll have options. Who knows if I would if I did more damage to it by powering through pain. Ah, the Lowell showboat. I have a former roommate who lives there. Nice little town. And I'm awfully glad you had a good day. I knew you'd know what town I was writing about. NO way to write about it and still mask it from people who live near in this part of the state. I've had shoulder surgery and, of course, the original elbow surgery. This elbow area surgery really is more intense and debilitating. I won't be rushed in surgery and trust me he isn't like that. On the next appointment he'll lay out all the options starting out with the least invasive on up to major surgery. He always wants you to start at the bottom and in some cases, we got enough relief from something that we didn't need to do try the next step. Between seven people in my family he's done 17 surgeries and this has been his MO for all of them. Several had gotten second opinions but went back to this doctor for his approach. He's been my bone guy since 2000. Jean, I'm so sorry about your arm. I hope that your doctor an help other then operating. Can those screws move into any dangerous areas of your arm? I'm sorry not commenting earlier. I was having some problems with my internet but now it's OK.
Friday was our 44th anniversary and our dinner was great. The Keg asked us if we were there for any special evening and after our dinner they gave us a special dessert for two. See ya my friend and I hope things come out, oops sorry about that, come out , that wasn't what I meant. See ya. I'll know more about the migrating screw and the backing out screw on my next appointment. I was only there to get the results of my bone density test so he had to fit me in between other people's appointments after he sent me next door for x-rays so time was limited. I will go with a list of questions, too. Glad you had a good anniversary dinner. Free deserts are great! Dear Jean, that really must give you a lot of pain because we are so in the habit of using our arms without thinking of it. And raising our arms. I so hope that something can be done to lessen the pain and to keep the screws from traveling any farther out. Peace. Well, why didn’t you create a complicated shoulder, screw, surgery situation??? Floating screw, huh? That’s an interesting concept. Perhaps you could elaborate on that. A complicated elbow-to-fingers situation is bad enough. I'm really glad my shoulder is not involved because it's the same arm where I did have shoulder surgery a couple of years ago. I'm guessing a lot of people live with metal floating around in their bodies. I remember reading about how Hemmingway drank a lot because of the pain of bits of metal from the war always floating to the surface of his leg and he'd pick them out with a jackknife. I'm afraid I'm not that brave. If I see a screw poking through the skin, I'd freak. With the inflammation down from the pills, it's really not all that bad. "It's always something!" is right! What a situation! I'm glad you have a great orthopaedic doctor who is methodical and innovative. Was there any reason to believe the first surgery was a result of medical malpractice? Astonishing to think all that was going on in there! No, to your question about medical malpractice. The first doctor is dead now anyway and was a well respected surgeon. At the time there were several bone doctors consulted on the breaks and she was the one with the most experience and was elected to do it. There was talk I could lose the lower half of my arm at the time if the bones could not be saved. She was one of those doctors who was followed around by a bunch of students and so I got to hear details and conversations not normally heard by patients. It was a nasty situation to fix. My present doctor said there is no way to know how long it took for those screws to back themselves out. I do have some nerve damage in my hand and I'll have to weigh up the pros and cons of another surgery doing more damage as opposed to doing pain management and an arm brace to prevent more stress on the bones. The doctor didn't say it, but in my opinion sometimes trying to fix something so messed up just makes it worse so I'm going to be open to trying every other thing first. I was here yesterday and got interrupted in the middle of writing a comment. So I'm back. I'm really sorry to hear about your elbow issues. It doesn't sound so good. I'd think twice about the surgery, too. Of course, if there's no other recourse... The problem with operations at our age is that we sometimes come out of them with another problem caused by the operation. I'm thinking of my esophagus damage from the anesthesiologist in my last heart procedure. I wish you the best with the pain management. There are talks about our Civil War monuments down here and what to do with them. There are a number of them. I remember the issues you were having with your esophagus. I hope they eventually healed back to its former self. Things like that can be life threatening after surgery even if not permanent! I'm not as physically fit generally than I was twenty years ago when I had the first elbow surgery either, to go through that again. I have a high tolerance for pain so I'm hopeful that whatever he's going to suggest for pain management with a physical therapist and maybe a protective gear to prevent more nerve damage might be enough. And tracking the screws to see where they go and when to go in an get them. People do live with stuff like that in their bodies. I think all the Civil War Monuments should be moved to Civil War Museums and national battle fields. They are a part of history but the reasons most of them were commissioned for places all over the south were done so to intimidate during the Jim Crow era. Jean, The elbow issues sound difficult. Is it really possible to live alone without ever lifting anything above your waist? I'm glad you've got a doctor who will help you consider all the options (none of them perfect) without choosing one for you and then trying to get you to agree. Good luck with both the decision-making and the pain management. The hardest part is remembering not to lift anything above my waist with my right arm! I had to get the vet to lift the dog into the car after surgery, so far that's been the only thing I couldn't find a work around. To Geeta: This blog does not accept submissions for publication. It's a personal blog, meaning everything here is from my thoughts and creativity.